I’m cautiously happy (as with all ante-post bets; they still need to get there) after the easy victory of Prince De Beauchene at Fairyhouse today, having tipped him at 25/1 for the National. He’s now as low as 7/1. Carrying just 10st 6lbs and still improving, given luck, he will have a strong chance. My other fancy, and one I think will shorten from his current price of 20/1 (with Ladbrokes and Stan James) is West End Rocker. Alan King’s horse has several things going for him as a potential National winner: the primary one is his apparent love of the course. He jumped round in the Becher Chase as though enjoying every minute, a huge advantage. 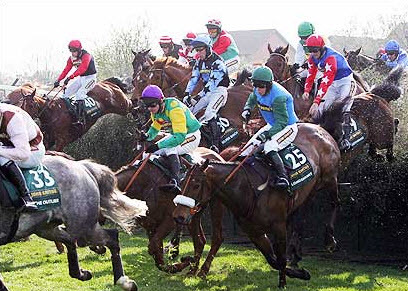 Not many horses love The National fences but those who do tend to run well again and again there. He first tried these fences last year in the National where he was unluckily brought down at Becher’s. Hutchinson has won on all three completed rides on West End Rocker (pulled up in the other one) and, for a long time was a most under-rated jockey. His talents have been revealed in the past few months when he took over as first jockey at Alan King’s temporarily (R Thornton was out injured). He’s already been confirmed to ride the horse at Aintree and that’s another significant plus as he will once again try to get the horse switched off and into a rhythm. Although the Becher victory was on heavy ground, he has no going preferences, another positive in ante-post betting. Over the 3m 5f Becher trip he was staying on strongly (he’d previously won on heavy over the same trip at Warwick). Stamina won’t be an issue and he has also won over 3 miles so he’s not just a plodder. West End Rocker has just 10st 12lbs and, with the 25s PDB long gone, is now the value bet. Update on 11th April – Prince De Beauchene is out of the race (injured). West End Rocker is now as low as 10/1. ‹ PreviousIs the RSPCA ready to leave racing and can racing prosper without them?